Poe Valley is a favorite place for many Pennsylvanians to camp and fish. Many have been coming here for decades and fishing the lake and the creek below it. Meanwhile, if you haven’t been here in the last month expect many changes to Big Poe Creek. The storm that whipped through in early May gave the system a facelift. Fortunately, trout remain, but many of your favorite holes have likely changed. Let’s step back to the first week of May when a line of dangerous storms stomped their way through the greater State College area. High winds snapped trees like they were pretzels, creeks flooded and power remained out for days in many areas. Poe Valley was affected. We arrived two days after the storm to film an episode of Pautzke Outdoors in this small stream that’s heavily stocked by the Pennsylvania Fish & Boat Commission and while the water level wasn’t murky or high there were hundreds of downed trees along the bank. We fished the creek with Zettle Outdoors and the locals almost didn’t recognize the creek. Many of their favorite spots were covered by 100-foot long trees. Fortunately, the creek was planted the week prior and trout weren’t harmed. We know this because the trees didn’t fall in the stream rather over it. And, everyone’s honey hole (the big one below the dam and small falls) was spared. Everything downstream has likely changed. Fortunately, you won’t need waders to fish the creek anymore. Downed trees provide easy passage. The good news is the creek remains loaded with trout. When we fished it the first week of May we arrived at 6:30 pm on Wednesday and had the show filmed by 7, which was shocking considering how hard we had to fish to get footage in the Poconos earlier in the week. The creek hadn’t been stocked in about a week, weekend crowds had hit it hard and we were still able to find constant action. I think part of it was we were showing the trout something new. Armed with Pautzke Chartreuse Garlic salmon eggs there were only a few drifts that night that didn’t provide bites. In fact, we caught and released more than three dozen trout between two anglers in the first 30 minutes. Action was so good that I balanced myself on a rock a few feet from the creek’s deepest hole and used a boom to place a GoPro in the water to film the action. The trout chased and hit the eggs only inches from the GoPro, which made for amazing footage. There was about two feet of visibility. If there was more the video would have been some of the best we’ve ever shot. The PA Fish & Boat Commission stocks this creek frequently during the spring to provide campers and day users with quality trout fishing. The week we were here 90 percent of the trout we caught were brookies. Most of them were running 12 inches, which is more than impressive for a small mountain stream. On the other hand, when it was last stocked on May 10 only rainbows and browns were planted. There should be all three species in the creek. Action should remain steady through Memorial Day, if not longer. Trout will be available in the pool below the falls and throughout the campground area. Due to the number of trout plants that have taken place this season the fish have scattered throughout the system. We caught them on Chartreuse Garlic salmon eggs fished on a small size 10 Eagle Claw hook. At the end of the night we switched over to Pink Shrimp and Natural Deluxe eggs and caught a few on those, too, but the chartreuse worked so well we didn’t need to use anything else. You likely won’t either. Editor’s Note: Pautzke’s new salmon eggs are available at most Pennsylvania Walmart locations, Bass Pro and Field & Stream. 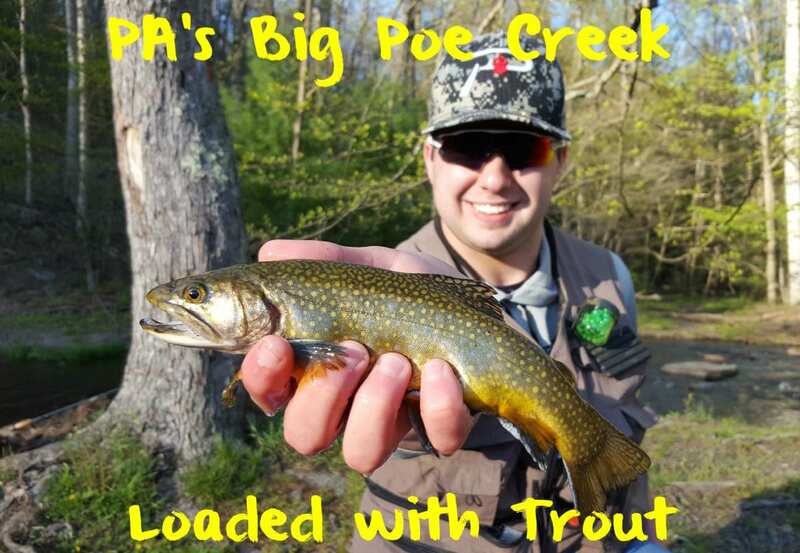 Big Poe Creek was stocked May 10 for the last time this season. For more information on visiting Poe Valley State Park please visit http://www.dcnr.state.pa.us/stateparks/findapark/poevalley.